Hot Tank Dip & Recirculating Detergent for Aluminum. For hot vat or recirculating spray unit cleaning of alternators, carburetors, transmission castings, starters. 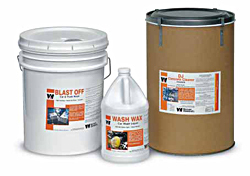 For removal of grease, oil, paint, light rust, and dirt from aluminum, zinc, alloys, cast and Babbitt metal. Solution is not flammable. No flash point. Speeds repair work time by providing maximum cleaning.